An attractive pair of Korean elm chests. A lovely pair of Korean elm chests. We date these chests to the late 19th century. The chests sit on small stands. The chests consists of a central two door cupboard. The chests and stands have ornate brass hardware. The chests have a height of 31" (79cm), a width of 36" (92cm) and a depth of 17" (44cm). 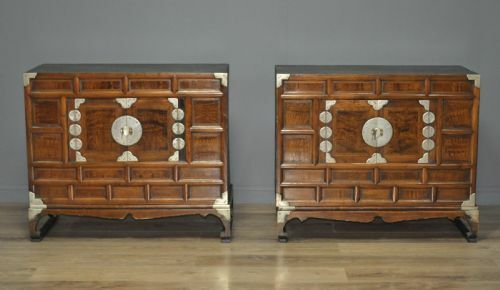 This lovely pair of Korean elm chests have been constructed to a high standard and remain in a good solid condition with only very minor surface markings commensurate with age. There are some minor surface marks and indentations to the top surface from past use to the finish. One of the small locks is missing from one chest. This remains a very stylish and elegant pair of chests which will continue to provide good service for many years to come. 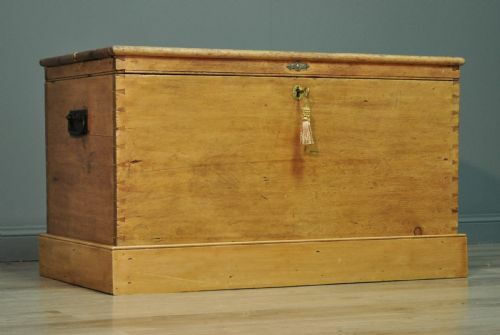 Attractive very large antique Victorian pine kist chest blanket box. A lovely large antique Victorian pine kist chest. We date this kist to the second half of the 19th century. The chest sits on a slightly protruding plain plinth base. The kist comprises a large rear hinged lidded box. There are metal handles on either side of the chest. The interior has a large open space, there would have originally been a large tray to the top but this has been removed at some point in the past. The kist has a lock fitted, no key is supplied but a suitable replacement should be easily obtainable. The kist has a height of 28" (71cm), a width of 49" (125cm) and a depth of 24.5" (62cm). This lovely pine kist remains in very solid condition with only minor surface markings commensurate with age and usage. There is an amount of wear, indentations and marks to the top surface from past use. There are a few old repairs and the hinges have been replaced and repositioned at some point in the past. This remains a very stylish and functional pine kist which would function well as a toy storage box or a linen chest etc. It will continue to provide good service for many years to come. A lovely large antique Victorian pine kist. We date this kist to the second half of the 19th century. The kist has a lock fitted (key supplied). The kist has a height of 24" (61cm), a width of 51" (131cm) and a depth of 25" (63cm). This lovely pine kist remains in very solid condition with only minor surface markings commensurate with age and usage. There is an amount of wear, indentations and marks to the top surface from past use including some slightly heavier indented lines. 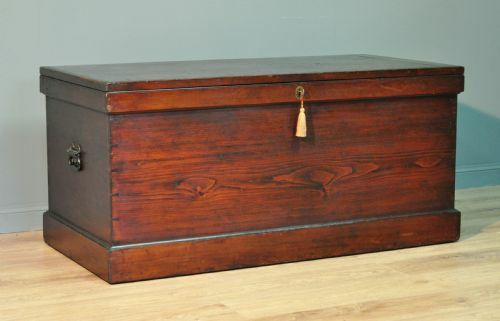 Attractive large antique Victorian pine kist chest blanket box. A lovely antique Victorian pine chest. We date this kist to the second half of the 19th century. The interior has fittings inside, these are missing their small drawers and lift lid. The kist is fitted with a lock, key supplied. The kist has a height of 22" (56cm), a width of 37" (94cm) and a depth of 21" (54cm). This lovely pine kist remains in a solid condition with only minor surface markings commensurate with age and usage. There is an amount of wear and marks to the top surface, and some gaps between the top panel and the frame due to shrinkage over time. The bottom plinth has been replaced and there is some old worm holes to the base. Attractive antique Victorian pine kist chest blanket box. A lovely antique Victorian pine kist chest. We date this kist to the second half of the 19th century. The kist comprises a large rear hinged lidded box. It has been painted black to the outer sides and the top surface has been covered in a green vinyl material with stud detail. There is further studwork decoration to the front of the chest. The interior has been lined with light green paper. The kist has a height of 18.5" (47cm), a width of 33.5" (85cm) and a depth of 19" (48cm). This lovely kist remains in very solid condition with only minor surface markings commensurate with age and usage. There is an amount of wear and marks to the outer surfaces, and the lock is inoperable. 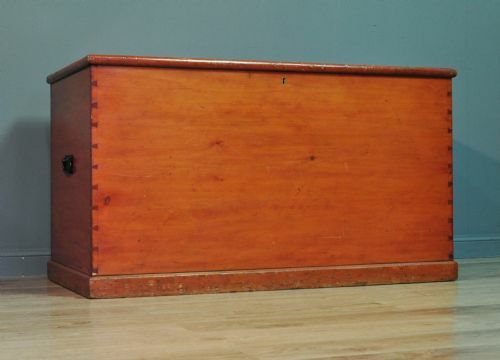 This remains a very stylish and functional kist which would function well as a toy storage box or a linen chest etc. It will continue to provide good service for many years to come. Attractive antique metal bound pine chest blanket box. A lovely antique pine chest. We date this chest to the early 20th century. 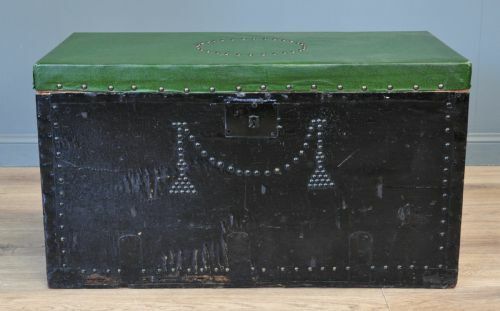 The chest comprises a large rear hinged lidded metal bound box. The chest has a large campaign style handle to each side and the top is designed to be screwed down for transporting. The lid is held up on later added metal chains. 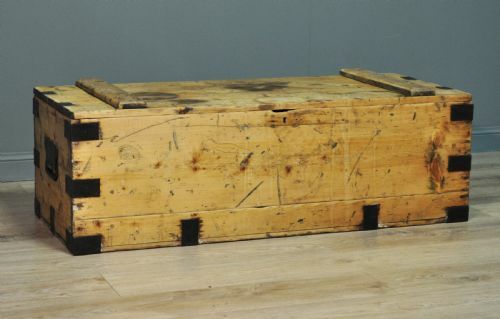 The chest has a height of 16" (40cm), with a width of 49" (124cm) and a depth of 20" (51cm). This lovely chest remains in a solid condition with only surface markings commensurate with age and usage. There is an amount of wear to the finish from past use and the metal work is showing a bit of oxidisation. There is a later added support bar inside the chest and the lock has been removed at some point in the past. The top surface has some larger darker marks and the rear is missing a couple of the metal straps. This remains a very stylish and functional chest which would function well as a toy storage box linen chest etc. It will continue to provide good service for many years to come.